Laudem Gloriae: "He died like a saint. He looked not like a contriver of treason." "He died like a saint. He looked not like a contriver of treason." 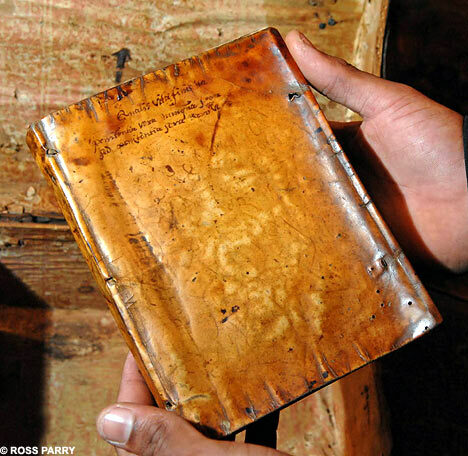 A 17th-century book on auction in London this weekend is said to be bound in the skin of Jesuit martyr Fr. Henry Garnet and bears the imprint of his bearded face. Though Fr. Garnet was charged with conspiring in the Gunpowder Plot, he claimed during his defense that, although he knew the men involved, he knew nothing of the plot itself, and never had any reason to suspect them of treason. The image of Fr. Garnet's face on the book cover follows another tradition relating that Fr. Garnet's face appeared on a bed of straw immediately after his execution. The hurdle was drawn by three horses from the Tower toward the place of execution. Father Garnet lay on it with his hands held together and his eyes closed; he had the air of "a man in deep contemplation". All the way, the streets were crowded with citizens eager to catch a glimpse of the condemned man. A scaffold had been erected near St. Paul's for the prisoner, and all around it were wooden stands set up for spectators. The surrounding windows were also packed with onlookers. The Sheriff of London was present, as were Sir Henry Montague, the Recorder of London, the Dean of Winchester, Dr. George Abott, and the Dean of St. Paul's Dr. John Overal. They were there not to honour Garnet, but determined to secure the last-minute repentance and even the conversion of this notorious Jesuit. When the church officials set about arguing with Garnet on the scaffold about the superior merits of Protestantism, the priest "cut them off quickly", asking them not to trouble themselves---or him: "he came prepared and was resolved". Garnet then desired some place apart where he could pray by himself for a moment. When Garnet was asked---according to custom---whether he had anything further to say, he apologised for his own weakness, including his failing voice. But he did call attention to the appropriate date on which he was to die: "Upon this day is recorded the Invention [Finding] of the Cross of Christ, and upon this day I thank God I have found my cross..." Although Garnet continued to deny his own guilt, he did take the opportunity to express once more his horror at the fact that Catholics had planned such an enterprise. In the future, he directed all Catholics to remain "quite", possessing their souls in peace: "And God will not be forgetful of them". Father Garnet himself assisted in the stripping off of his clothes down to his shirt; this was very long and Garnet had had the sides sewn up almost to the bottom in the interests of modesty. On the ladder itself, he paused and made the sign of the Cross, desiring all good Catholics present to pray for him. One person in the crowd had evidently been assured that there would be a dramatic last-minute conversion to Protestantism---a rumour spread widely in the city by government agents. As Garnet stood at the bottom of the ladder, this disappointed person shouted out: "Mr. Garnet, it is expected you should recant." "God forbid", he replied. "I never had any such meaning, but ever meant to die a true and perfect Catholic". Father Garnet's last prayers were in Latin, the language of the "one" Church into which he had been born and in whose service he had spent his life. The priest crossed his arms over his breast---it had not been thought necessary to bind his arms---and "so was cast off the ladder". His arms remained cross, for he made no struggle against death. He hung motionless at the end of his rope. At that moment a strange change in mood gripped the crowd. Many of the spectators had deliberately made their way to St. Paul's in order to see a gruesome spectacle which culminated with the bloody axing and quartering of a still living human body. A great number of those present---they cannot all have been Catholics---surged forward. With a loud cry of "hold, hold", they stopped the hangman cutting down the body while Garnet was still alive. Others pulled on the priest's legs, something which was traditionally done by relatives in order to ensure a speedy death. As a result Father Garnet was "perfectly dead" when he was finally cut down and taken to the block. In their compassion they refused to see him butchered alive; and when he was cut up, his bowels cast into the fire, and his heart held up aloft with the cry, "Behold the heart of a traitor!" it met with no applause, not even the usual response, "God save the king." "He died like a saint," "he looked not like a contriver of treason," were comment heard among the crowd. Even ministers were heard to say that without doubt his soul was in Heaven. Thus this holy man passed to his eternal reward, 3 May 1606, aged 51. A cornhusk, used as straw in the basket holding Fr. Garnet's severed head, was stained with his blood and, because it bore a perfect image of his face, was kept as a relic. The fame of this relic grew such that the Bishop of Canterbury desired to examine it. Father Richard Blout wrote in a letter dated March 1607, "It cannot be a thing natural or artificial. The sprinkling of blood hath made so plain a face, so well proportioned, so lively shadowed as no art in such manner is able to counterfeit the like." The husk was hidden at the Spanish Embassy, after which it was smuggled to France and kept by the Society of Jesus. It disappeared in the turmoil of the French Revolution.